Safehoop's S-Hoop 2.3mm 8 inch 5 lug batter (top) or resonant (bottom) side tom drum rim in chrome plating. 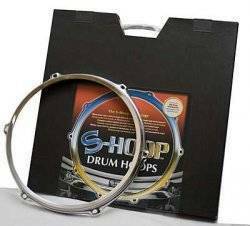 The Safehoop S-Hoop tom drum hoop has an inward beveled top flange which gives a wider surface area and also protects the tom drum's bearing edges. Can be used for the batter or resonant side of a tom drum.